Oscar Mayer is selling a limited number of mini remote-controlled versions of their Wiener Rover just in time for the Christmas season. The Wiener Rover is basically a smaller all-terrain version of the Wienermobile that was introduced this year on July 23rd and includes a compartment to hold hot dogs. The mini version can carry one to two hot dogs and is 1:14 the size of the original Wienermobile (it's 11 inches tall and 22.5 inches long). It's battery operated and can go up to 30 miles per hour. 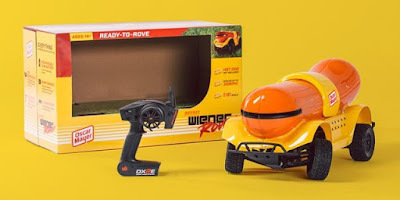 The Mini Wiener Rover is only being offered for $25 (with free shipping and handling) in very limited quantities via Twitter's recently launched "Buy Now" button. You're chances of getting one aren't too good as they're only selling about 15 a day for seven days (starting yesterday) and the sale time varies each day. If you want to give it a go, you can follow Oscar Mayer on Twitter to find out exactly when the next batch will be available.